Trigger warming: This week's comic for Investing.com deals with a severe beating and may be disturbing to some readers. Particularly Brazilians. Germany and Brazil went head to head in the World Cup this week and the results weren't pretty. Germany annihilated their Brazilian hosts 7-1. This defeat was particularly disappointing given Brazil's World Cup history: The last time the tournament was held in Brazil was in 1950. Brazil lost to Uruguay in the final round and apparently they're still depressed about it. Their hopes to redeem themselves on their home turf (they've won five times since then, which seems like it would have washed the taste of the 1950 game out of their mouths) were efficiently and mercilessly wiped out by Germany's wood chipper of a soccer team. 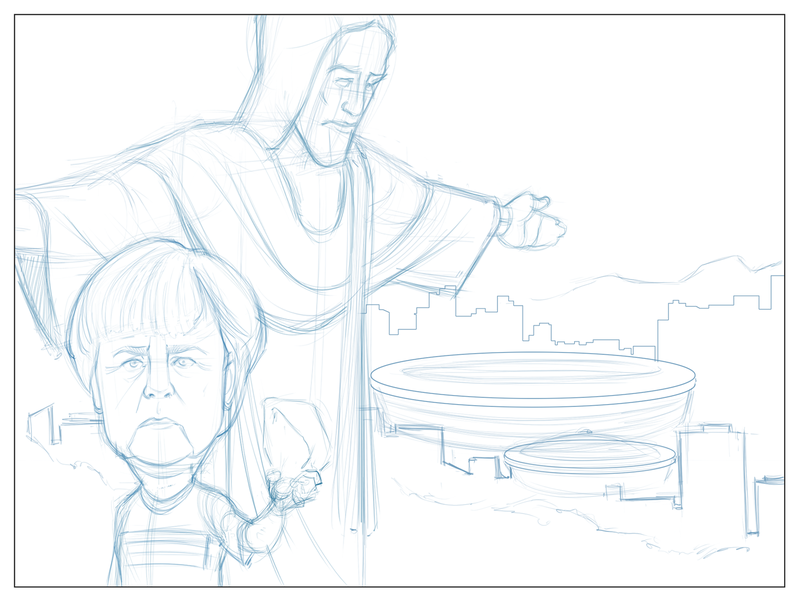 In memorium, I was asked by the crew at Investing.com to draw a comic featuring the famous Brazilian statue (Christ the Redeemer) with the Maracana stadium in the background and Angela Merkel in the foreground. 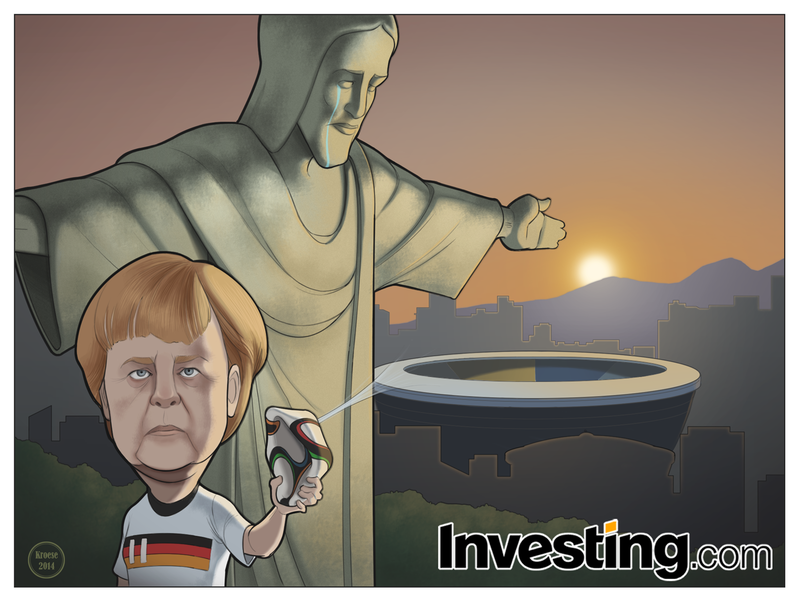 They wanted the statue to be crying and holding the official World Cup ball. Of course, I sent it off with the caveat that I was perfectly willing to change the comic back to the original idea if they preferred. After all, it's my job to provide what they want. But I've also been drawing cartoons and comics for a while. 14 years, actually. Since I first started cartooning for my college's student newspaper in 2000. Those were golden days. President Taft had the country humming, Ford had just released the Model T, and Penny Farthing bicycles rolled up and down every sidewalk. When I first started out, my comics were AWFUL. I'd been drawing most of my life already and reading comics to boot, so I figured drawing good comics would be a cinch. Turns out, not so much. The drawings were terrible, the compositions were worse, the concepts stunk and the jokes were laughable. But not in a good way. But I kept at it and wasn't fired somehow. At one point, I was doing six cartoons per week for three different organizations. You're bound to see some improvement with that much work. Eventually, the Associated Collegiate Press voted me the best college cartoonist in the country and the money never stopped flowing. I had my award plated with platinum and I wear it around my neck like Flavor Flav. They liked the change and ran it. Personally, Merkel staring directly into the camera while she crushes the ball with one hand makes me laugh every time I look at it. But maybe that's just me. I think this is a good comic. Of course, if you read any of my reflections on these comics, you'll know I don't always like the result. Experience is hardly an inoculation against crappy cartoons. But it helps.